There is nothing like the beauty of leather. You can use it and abuse it for years and it still stands up and looks great. When looking for Valentine's Day or Mother's Day gifts for someone special, choosing a lovely leather case is a smart choice for a gift that will last a long time. At Chasing Treasure, we have some amazing leather Train Cases that will make a great gift selection for you. The term Train Case refers to a specific type of jewelry box. They are normally square with a lid that locks closed. There is a handle to carry it and inside there is typically several drawers and compartments to store your jewelry pieces and goods. The cases that we offer are made of top quality leather and are lined with soft material like velvet. Just beautiful! 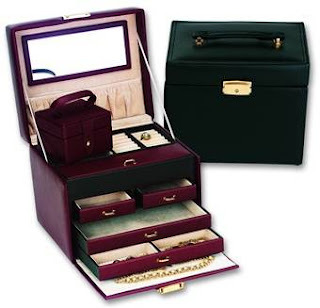 What is nice about this style of jewelry box is that you can take it with you when you travel. Plus it can be stored out of sight in a closet or cabinet if you prefer to not have it out on display in the bathroom or bedroom. It is a perfect solution for those that have a lot of jewelry but love to bring it with wherever you go. College girls love this type of case because it can hold all of their jewelry of course and when they travel back and forth between school and home, it is a snap to close it up, lock it and out the door you go. You never have to worry about leaving special pieces at school or losing something. We offer several different sizes of these wonderful TrainCases at our site along with varying price points so you can find a special case that will work just right for that certain someone on your shopping list this holiday season. Come by and see these beautiful pieces and choose one today. This gift will be sure to put a happy smile on her face!